Major League Bishop: Ben is One Week Old! They grow up so fast, don't they? 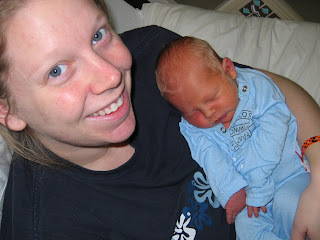 Ben is One Week Old! They grow up so fast, don't they? I thought I'd try to give you a little update myself while Ben is sleeping. It's good to be home, AGAIN! 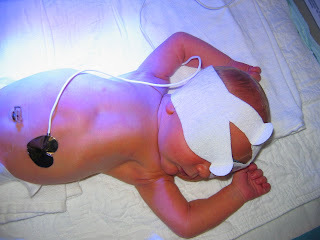 Ben ended up in the hospital again on Friday because of his jaundice. Pretty common in babies, especially those that are a bit early. His was reaching "toxic" levels and they wanted him under the lights. I was able to stay with him, and Brian got to go home and sleep all night. He's been fighting a pretty bad cold all week so he needed it. I wasn't so lucky with sleep in the hospital. I just wanted my little guy home. We got to come home last night (Saturday) and it's been good to try to get settled in again. Other than Brian having a cold, and Ben being radioactive yellow, we're all doing pretty well. My headache is gone. For those who don't know, I ended up with spinal fluid leak from my epidural (which I don't think worked anyway). It is basically a really bad migraine any time you sit up or stand. I did get a treatment called a blood patch on Tuesday before we left, but it didn't hold, and by Wednesday night I had the headache again. But, like I said, it is gone now, so I'm feeling pretty great taking care of Ben. He's been such a good baby. He eats well, sleeps well, and has these alert times that are so great to watch. I thought I'd attach some pictures. There are a couple of us leaving the hospital (the first time). Then Ben under the lights. I thought those eye patches were so funny. He looked like a masked super hero! And yes, he HATED them. 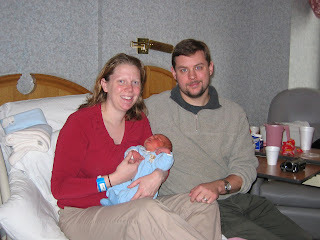 Then a picture of him and me when we got the ok to leave the hospital (the second time). We've had a lot of family around which has been nice considering how we're all feeling. Brian's parents came Monday through Friday and REALLY helped out. We also got to celebrate a little Christmas with them. My parents and sister, Stephanie, came for a day and then are coming back next week. My sister, Lenore and niece Meghan came last night and stayed through today. She's now staying at my parents due to Blizzard 08 that she tried to drive home through and only made it to Kalamazoo. Then my little sister is coming tomorrow for a couple of days. I'm hoping Brian gets a video up soon, I can try this week, too. We've got some good stuff! Ok, I better go. I see little eyes trying to open and look at me now. I just cannot wait to share him with everyone! He is so stinking cute!